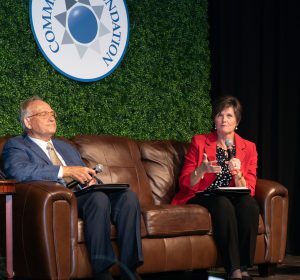 In our sixth annual Celebrating Community Philanthropy luncheon, more than 150 community leaders and champions joined with Central Kentucky Community Foundation to celebrate the impact philanthropy plays in our communities. The Sept. 20 event was a wonderful opportunity for us to pause, come together and focus on the type of legacy we wish to leave to the next generation. As part of the celebration, community partners shared personal experiences about how they have decided to pass on their legacy through Central Kentucky Community Foundation so that opportunity is left for the next generation. The luncheon, at Grace Heartland Church in Elizabethtown, served to help launch the Give Five Legacy initiative. Give Five encourages donors to consider a gift of 5% designated to a cause important to them in their estate plans and the community will benefit forever. Nannette Johnston and D. Michael Coyle spoke about their experiences including Give Five in estate planning. Coyle, an attorney, helps clients through the process of estate planning and shared how he encourages giving through the foundation to ensure a client’s legacy carries long past their lifetime. Johnston shared how she and her husband, Kenneth, followed the motto “give while you live” and how it was an “automatic decision” to continue that by giving 5%. Coyle and Johnston both asked, “Why Not?” when it came to making a decision to Give Five. Just as opportunities and experiences granted to each of us by the community are personal, the legacy donors give to support the community can reflect their experiences. CKCF can help carry out your personal legacy for our community, just as we did for Johnston. To learn more about Give Five or to start ensuring your legacy, go to http://ckcf4people.org/give-five/. 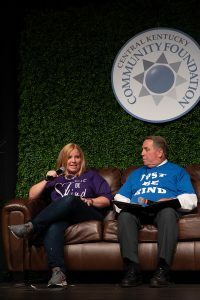 Attendees also heard from Tricia Bagley Smith and Ernie Bagley about the Just Be Kind Campaign and how, through a simple gesture of making “Just Be Kind” signs, their message has impacted the community. Not only are their signs visible on about every neighborhood street, but through their work, proceeds are helping people such as families with funeral expenses and a woman was given a car as a steady means of transportation to work – prior to which she had walked more than two miles each way to get to. Through the Marvin and Joyce Benjamin Fund of CKCF, with part of its mission to fight hatred, Just Be Kind signs were a parting gift for luncheon guests. Lindsey Keith Alicna, Jeff D’Alessio and Reese Nickell spoke about how participation in sports have had a positive effect on their lives. 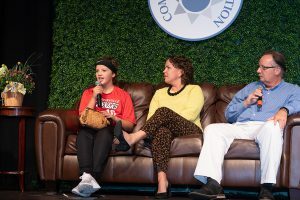 Each had a personal story about how youth sports have impacted themselves – by building confidence, making friendships and instilling a strong work ethic – or, for Alicna and D’Alessio, for their children as well. Because of this fondness for youth sports and how it benefits the life of a child, donors established the Youth Sports Fund of Hardin County. The fund provides support for youth sports registration fees and to purchase athletic equipment for a child, who otherwise would not be able to participate. …you need a FOREVER partner.